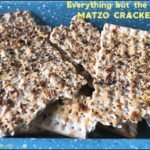 Everything but the Bagel Matzo Crackers -- Three Ingredients! 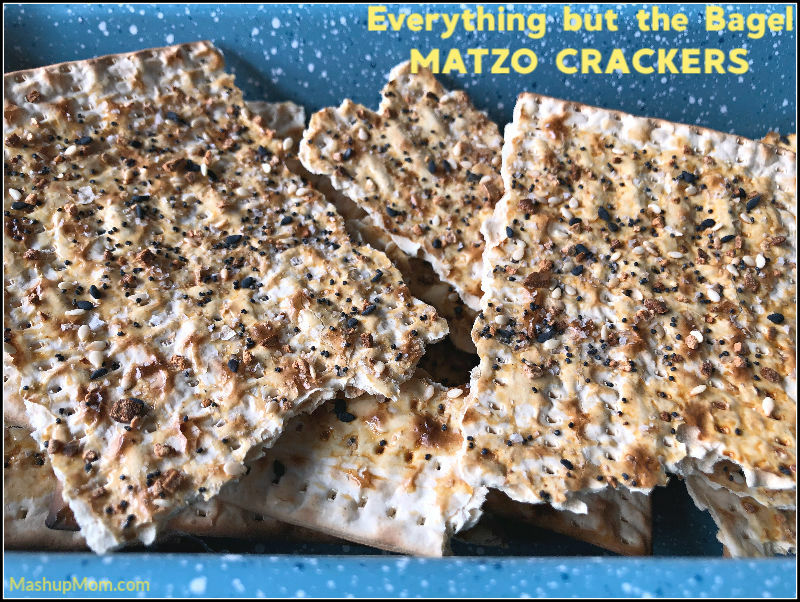 Just three ingredients and a little time turn plain old matzos into… Everything but the Bagel Matzo Crackers! Enjoy! Hey all! 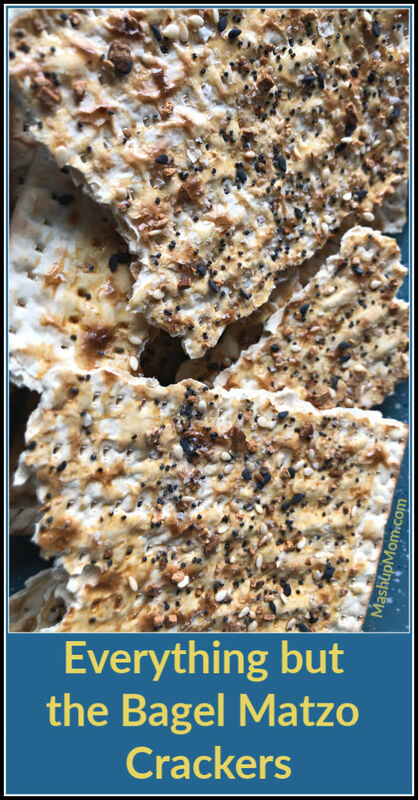 So I saw this savory matzo crackers idea in the April issue of Martha Stewart Living magazine, of all places. 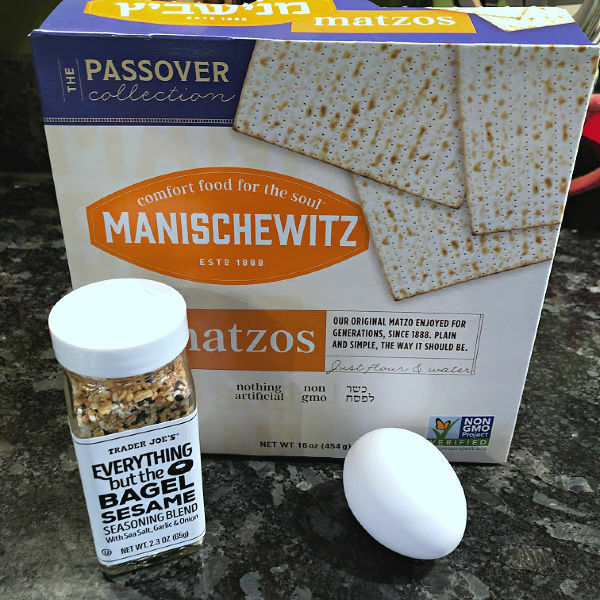 In today’s easy three ingredient recipe for the Passover season, I took their original “egg-white-plus-za’atar” idea and turned it into an “everything-but-the-bagel-plus-a-whole-egg-because-who-wants-to-separate-that” idea, in these Everything but the Bagel Matzo Crackers. 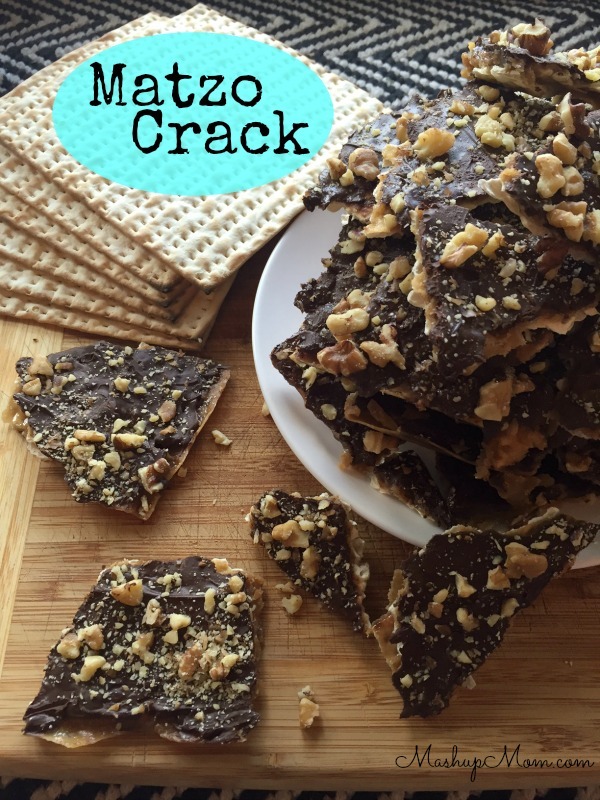 Why matzo crackers this weekend in particular? 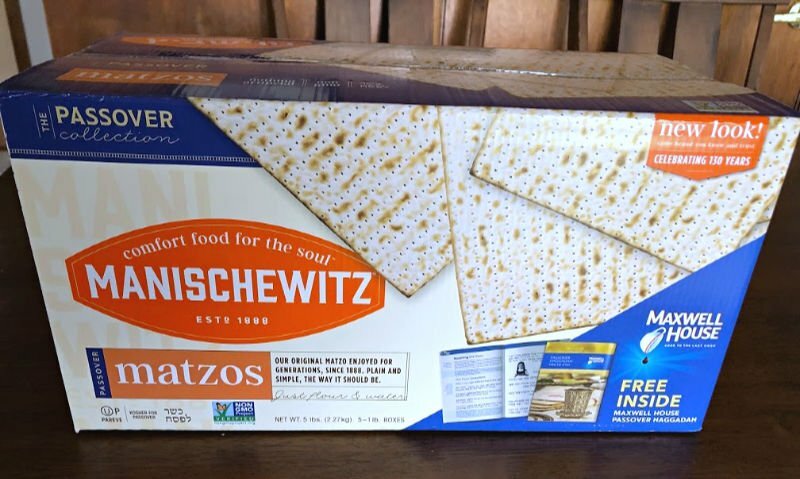 Well, this week I picked up a huge 5 lb box of matzos at my neighborhood grocery store for just $1.99 — because, ’tis the season! Check out their new box design and fancy non-GMO labeling this year — but inside, it’s the same as it ever was. To console myself for the lack of a limited edition Haggadah, I may have just eaten a few too many of these (garlicky salty good) everything but the bagel matzo crackers. Give them a try, if you are looking for a different way to enjoy your own big box of matzos this year. Beat egg in a small bowl with 1 tsp water to thin it out a little. 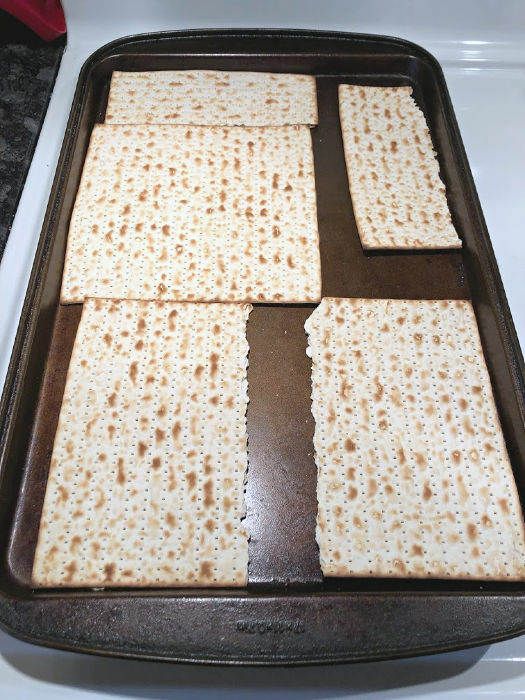 Carefully break matzos into several large pieces so that it all fits nicely on one cookie sheet, then brush each piece with egg wash.
Sprinkle matzos evenly with everything but the bagel seasoning, then bake at 350 degrees for 8-9 minutes or until they smell great and the egg has dried. Let cool a bit, then break into pieces and enjoy! Note: You’ll end up with plenty of extra egg, if you want to double this or make a second batch. 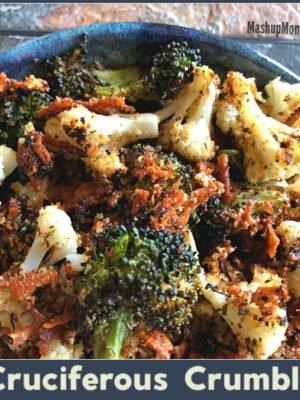 You can pick up everything but the bagel seasoning at Trader Joe’s, some Costco stores, or online. 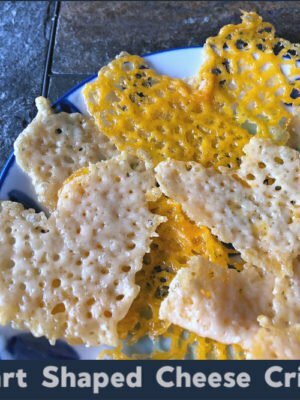 These crackers are still going to be on the dry side, because, let’s face it: You’re just jazzing up matzo here. It’s not a magical recipe, but it’s still a fun way to add some salty & garlicky zip to your matzos. 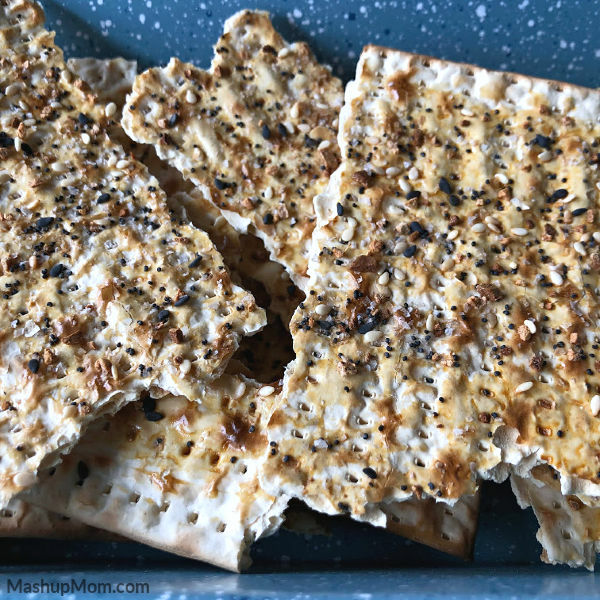 Dry or not, though: Everything but the bagel matzo crackers are also quite tasty, and a nice cracker to use for scooping up hummus or other dips. 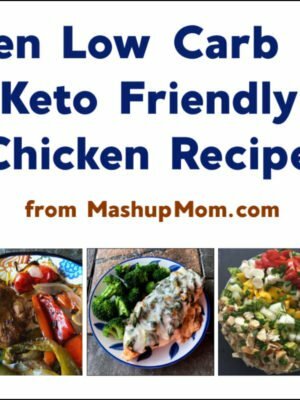 Need another way to enjoy matzo this year? 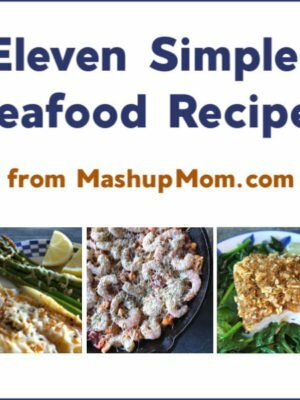 You’ll end up with plenty of extra egg, if you want to double this or make a second batch. You can pick up everything but the bagel seasoning at Trader Joe’s, some Costco stores, or online.